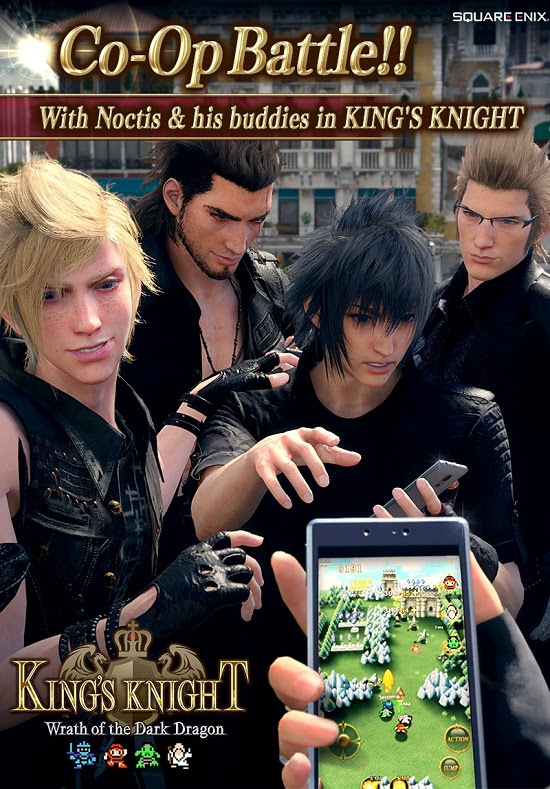 FINAL FANTASY XV fans can now join Noctis and his brothers-at-arms in the action RPG mobile game KING’S KNIGHT –Wrath of the Dark Dragon– in a special crossover event. Now through March 2, players can enlist Noctis, Prompto, Gladiolus and Ignis during cooperative-play battles. KING’S KNIGHT –Wrath of the Dark Dragon– is the vertical scrolling shooter game that appears throughout the story of FINAL FANTASY XV. The reborn version of this classic 1986 title for the Nintendo Entertainment System features a brand new story and world where players must defeat onscreen enemies while simultaneously destroying obstacles in their path. KING’S KNIGHT –Wrath of the Dark Dragon– is available as a free download on the App Store for iPhone and iPad and on Google Play for Android Devices.